Jerricho Cotchery (born June 16, 1982) is a former American football wide receiver who played in the National Football League (NFL) with the Carolina Panthers, New York Jets, and Pittsburgh Steelers from 2004 to 2015. He played college football for North Carolina State University. Cotchery graduated from Phillips High School in Birmingham, Alabama. He played wide receiver and defensive back and was named to the All-State team after his junior and senior years. He lettered in football and basketball in all four years of high school. Cotchery played shooting guard on the basketball team. Cotchery majored in sports management at North Carolina State University. Cotchery played 49 games at North Carolina State. In 2002 and 2003, he was selected to the All-Atlantic Coast Conference first-team. Cotchery's 200 career receptions and fifteen games with 100+ receiving yards broke two school records previously held by Torry Holt. Cotchery and Holt are the only two wide receivers in NC State football history to have two seasons of 1,000+ receiving yards. Cotchery also tied the school record for most consecutive games with at least one reception in thirty-nine straight games. Cotchery's fifteen career games of 100+ receiving yards tied him for second place in Atlantic Coast Conference history. He also ranks fourth in career receptions and career receiving yards. Cotchery and Peter Warrick are the only two receivers in ACC history with 200+ career receptions and 3,000+ career receiving yards. His 3,319 receiving yards are 33rd in NCAA history and his two hundred career receptions tie him for 42nd. Cotchery was selected by the New York Jets in the fourth round with the 108th overall pick in the 2004 NFL Draft. He was the 16th of 33 wide receivers taken in the draft, but over his career would have more success than expected from his relatively late selection, second in receiving yards only to Larry Fitzgerald (including 16 tight ends). In 2004, Cotchery caught six passes for 60 yards in twelve games (with no starts) as the team's fifth receiver. As a kick returner, he had thirteen returns for 362 yards, 27.8 yard average, and one touchdown. Cotchery entered the 2005 season as the New York Jets fourth string wide receiver. An injury to Wayne Chrebet caused him to be moved up the depth chart to third string. Cotchery played in sixteen games (with one start), catching nineteen passes for 251 yards with no touchdowns. He returned four kicks for 105 yards, a 26.3 yard average, and twenty-three punts for 182 yards, a 7.9 yard average. New Jets head coach Eric Mangini called Cotchery the "most outstanding player in our offseason program" and promoted him to second starting wide receiver opposite Laveranues Coles. Cotchery started for the Jets in week 1 against the Tennessee Titans. He had six catches for 65 yards, and caught his first NFL touchdown from quarterback Chad Pennington. The next week, Cotchery had six catches for 121 yards and a touchdown, which included a career-long 71-yard catch in a 17-24 loss to the New England Patriots. In week 4, Cotchery had another touchdown catch in a 28-31 loss to the Indianapolis Colts. In week 10, the Jets beat the Patriots at Gillette Stadium 17-14. Cotchery had six catches for 70 yards and a touchdown moving the Jets to only one game behind the Patriots for first place in the AFC East. In week 12, Cotchery had seven catches for 110 yards in the Jets' 26-11 win over the Houston Texans. The following week Cotchery had nine catches for 99 yards and a touchdown against the Green Bay Packers at Lambeau field as the Jets won 38-10. The Jets' final record was 10-6. They were 7-6 after week 14 but won their last three games to make the playoffs as a wildcard team. Cotchery ended the regular season with eighty-two catches (tied for 16th in the NFL) and 961 yards (twenty-second). Cotchery had 100 receiving yards and a touchdown in the Jets' wildcard weekend loss to the New England Patriots. Cotchery signed a multi-year extension with the Jets on March 1, 2007. The Jets opened the 2007 season against the New England Patriots, the team that had eliminated them from the playoffs the previous year. Cotchery had six catches for 57 yards in a 14-38 Jets loss. After the game, a closer look at video replays found that the Patriots had been taping the New York Jets' defensive coaches' signals. Later it was called Spygate. In week 2 against the Baltimore Ravens, Cotchery had seven catches and set a new career high of 165 receiving yards in a 13-17 loss. On September 30, 2007, Cotchery had eight catches for 107 yards as the Jets lost to the Buffalo Bills. Cotechery scored his first touchdown of the season in week 7 when the Jets were playing the Cincinnati Bengals He had six catches for 60 yards in the game. Halfway through the season, Cotchery's team stood at 1-7 and faced a quarterback controversy between Chad Pennington and Kellen Clemens. In week 11, the Jets defeated the Pittsburgh Steelers who were considered a playoff contender at the time. It was the biggest win of the season for the Jets and brought their record to 2-8. Cotchery, however, only contributed one catch for 5 yards. On Monday, November 26, 2007, Cotchery injured his right index finger during practice. The finger required surgery, but Cotchery only missed one game. Cotchery lines up for the play. Cotchery had six catches for 119 yards in his first game back after surgery as the Jets lost to the Cleveland Browns 24-18. In a week 16 loss to the Tennessee Titans, Cotchery had eight catches for 152 yards with a touchdown, which was the only score for the Jets that day. Cotchery had eight receptions for 76 yards in the final game of the season, which resulted in an overtime win against the Kansas City Chiefs. Although Cotchery had enjoyed his best season yet, the Jets' finished with a mediocre record of 4-12, earning them last place in the AFC East. Cotchery finished the season with team highs in: receptions (82), yards (1,130), receiving touchdowns (2) and had yards-per-catch average (13.8). Former Jets head coach Herm Edwards said he regretted not playing Cotchery more while he was coaching the Jets. In August 2008, the Jets traded for former Packers quarterback Brett Favre. In the first game of the season against the Miami Dolphins, Favre threw his first touchdown as a Jet to Cotchery, who finished the day with three receptions for 80 yards and a touchdown as the Jets won 20-14. In a week 4 win over the Arizona Cardinals, Favre threw for six touchdowns, including two to Cotchery, who had four catches for 67 yards. In week 11, Cotchery caught five passes for 87 yards in a win over division rivals the New England Patriots moving the Jets past the Patriots into first place in the AFC East. The following week, the Jets beat the undefeated Tennessee Titans 10-0, with Cotchery catching six passes and improving the Jets record to 8-3. 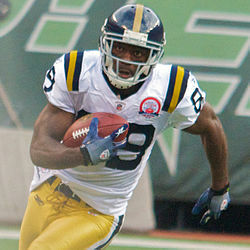 In week 15, Cotchery had a touchdown catch in a win against the Buffalo Bills snapping the Jets' two-game losing streak. The Jets were 8-3 and in first place in the AFC East. The Jets lost four out of their next five games and finished 9-7, missing the playoffs for the second straight year. Cotchery ended the season with seventy-one receptions for 858 yards, an average of 12.1 yards per catch average and five touchdowns. Cotchery played and started in all sixteen games. After the departure of Laveranues Coles to the Cincinnati Bengals, Cotchery became the Jets' primary receiver. In Week 1, Cotchery had six catches for 90 yards in the Jets win over the Houston Texans. In week 3, Cotchery had eight receptions for 108 yards, as well as his first touchdown reception of the season in a win over the Tennessee Titans. Cotchery finished 2009 with fifty-seven catches for 821 yards. The Jets finished the regular season with a 9-7 record and made the playoffs as a wildcard. The Jets defeated the Cincinnati Bengals in the wildcard round, with Cotchery catching six passes for 67 yards. The following week, the Jets beat the San Diego Chargers to reach the AFC Championship game against the Indianapolis Colts, where the Jets lost 30-17, with Cotchery catching five passes for 100. On April 11, 2010, the New York Jets traded for wide receiver Santonio Holmes and in exchange gave up a fifth round pick in the 2010 NFL Draft. Cotchery was positioned as third-choice wide receiver, behind Holmes and Braylon Edwards. On November 14, 2010, he had three catches for 43 yards and a touchdown in a 26-20 overtime win over the Cleveland Browns. Cotchery hurt his groin that week and missed the following two games. Cotchery finished the 2010 season with forty-one catches for 433 yards with two touchdowns while playing in 14 games. He started five games, the lowest number since the 2005 season. He was released by the Jets on August 4, 2011. Cotchery agreed to a one-year deal with the Pittsburgh Steelers on August 11, 2011, after he had met with the team at training camp the previous week. On April 12, 2012, he was reported to have re-signed with the Steelers for two more years, agreeing to a deal worth around $3 million. Between 2011 and 2013, Cotchery appeared in 43 games for the Steelers. He recorded seventy-nine receptions for 1,044 yards and twelve touchdowns. On March 20, 2014, Cotchery agreed to a two-year deal with the Carolina Panthers. He missed the week three game against the Pittsburgh Steelers because of a hamstring injury suffered during a practice on September 18. Through the first four weeks of the 2014 season, Cotchery had the distinction of being the only receiver in the NFL with double digit targets and to have a perfect catch rate – recording receptions on all thirteen targets thrown in his direction. In 2015, the Carolina Panthers played in Super Bowl 50, which was Cotchery's first appearance in the Super Bowl. In the game, the Panthers fell to the Denver Broncos by a score of 24–10. In the loss, Cotchery caught two passes for 17 yards but was credited with three drops, after having not dropped a pass the entire season. His first drop was a subject of controversy. After initially having the ball bounce off his hands, Cotchery managed to grab the ball on the way to the ground, but the pass was ruled incomplete as it seemed that the ball touched the ground as he was trying to get control of it. The play was challenged, and senior official Mike Carey believed it would be an easy overturn. The ruling of an incomplete pass stood. Two plays later, the Panthers would fumble the ball and the Broncos would recover it in the endzone for a touchdown. Cotchery's next drop came on the very next drive, on a third down play, which forced a Carolina punt on what had been a promising drive that had gotten out to midfield. His third was on a pass that was either going to be a touchdown or would set up Carolina inside the five yard line, the drive ultimately ending in a missed field goal. At the end of the 2015 season, Cotchery did not sign with another NFL team. In 2017, Cotchery joined the Carolina Panthers coaching staff as the assistant wide receiver coach. Cotchery grew up in the Norwood neighborhood of Birmingham, Alabama. His father, Bob, ran a lawn care service, and his mother worked in a nursing home. He was the second youngest of thirteen children in a blended family with siblings separated in age by as much as twenty-five years. He played basketball and football at Phillips High School. On May 30, 1998, he was in a severe car accident and still has scars on his wrists and hands. As of 2008, shards of glass continued to work their way up and out of his skin. Cotchery was born with six fingers on his left hand; one was subsequently removed. Cotchery married his wife, Mercedes, a month after being selected by the Jets in 2004. Cotchery and Mercedes have five children. The couple adopted their daughter, Jacey, in 2007. and have two sons, Joshua and Nicholas. The couple adopted another girl, named Journey, as well as a son in late 2017, Nile. ^ "NY Newsday T-Rock's take Tom Rock". Archived from the original on January 5, 2007. ^ Crouse, Karen (September 11, 2006). "In Return, Pennington Provides Jets' Counterpunch". nytimes.com. nytimes. ^ "Cotchery quite a catch for Jets". recordonline.com. recordonline. ^ "JETS: Scene and heard". recordonline.com. recordonline. ^ "Pennington gets back to high-flying ways as Jets climb above .500". usatoday.com. usatoday. November 26, 2006. ^ Crouse, Karen (December 7, 2006). "Jets' Cotchery Steps Into the Spotlight". nytimes.com. nytimes. ^ Pedulla, Tom (January 1, 2007). "Jets punch playoff ticket with rout of Raiders". usatoday.com. usatoday. ^ Matuszewski, Erik (March 1, 2007). "Jets' Jerricho Cotchery Receives Multiyear Contract Extension". Bloomberg. Retrieved March 1, 2007. ^ "Jets don't see loss as major setback". boston.com. boston. Archived from the original on September 21, 2013. ^ Pedulla, Tom (September 14, 2007). "Belichick apologizes for 'Videogate'". usatoday.com. usatoday. ^ Himmelsbach, Adam (September 17, 2007). "Jets Let Late Shot at a Tie Slip Away". nytimes.com. nytimes. ^ Waszak Jr, Dennis (October 1, 2007). "Jets bemoan mistakes and missed opportunities in loss to Bills". usatoday.com. usatoday. ^ Bishop, Greg (November 19, 2007). "Jets Show They Remember How to Win". nytimes.com. nytimes. ^ Cimini, Rich. "Jets lose Jerricho Cotchery to finger surgery, could miss rest of season". nydailynews.com. New York: nydailynews. ^ Bishop, Greg (December 24, 2007). "Long Season Takes One More Stumble Toward the Finish". nytimes.com. nytimes. ^ Cimini, Rich (December 28, 2007). "Jerricho Cotchery catches on after Herm Edwards' departure". New York Times. Retrieved September 13, 2009. ^ "Jets set for Brett: Packers legend headed to New York". ESPN.com. ESPN. ^ Wine, Steven (September 7, 2008). "Broadway Brett wins debut, helps Jets top Dolphins". USAtoday.com. USAtoday. ^ "Favre throws 6 TDs as Jets beat Cardinals". chinapost.com. chinapost. ^ "Jets outlast Patriots 34-31 in OT thriller". masslive.com. masslive. ^ "Brett Favre, Jets hand Titans first loss of season, 34-13". nydailynews.com. New York: nydailynews. ^ Myerberg, Paul (December 14, 2008). "Live Updates, Week 15 of the N.F.L. (Jets 31, Bills 27, final)". nytimes.com. nytimes. ^ Clayton, John (March 4, 2009). "Coles, Bengals agree to contract". ESPN.com. Archived from the original on March 5, 2009. Retrieved March 6, 2009. ^ "Jets' defense holds firm in end to stop titans". ESPN.com. ESPN. ^ "Sanchez, Greene perform under pressure as Jets extend playoff run". ESPN.com. ESPN. Retrieved October 23, 2012. ^ "Colts Beat Jets In AFC Championship, On Their Way To Miami For Super Bowl XLIV". Sbnation.com. sbnation. Retrieved October 23, 2012. ^ "Trade to Jets shocks banned Holmes". ESPN.com. ESPN. Retrieved October 23, 2012. ^ Rosenthal, Gregg. "Jerricho Cotchery completed the most badass play of the year". profootballtalk.nbcsports.com/. Pro Tootball Talk NBC Sports. ^ Cimini, Rich (August 4, 2011). "Jerricho Cotchery released by Jets". ESPN. Archived from the original on August 4, 2011. Retrieved August 4, 2011. ^ Dulac, Gerry (August 11, 2011). "Former Jets wide receiver Cotchery signs with Steelers". Pittsburgh Post-Gazette. ^ "Most Popular E-mail Newsletter". USA Today. April 12, 2012. ^ Newton, David (March 20, 2014). "Jerricho Cotchery joins Panthers". ESPN.com. ^ "Panthers lose Williams, Cotchery vs. Steelers". ^ "Super Bowl 50 - National Football League Game Summary" (PDF). NFL.com. Retrieved August 7, 2017. ^ "Sure-handed Jerricho Cotchery has big drops for Panthers". ^ "Mike Carey wrong again?! Panthers' first challenge fails on drop". ^ Henson, Max (March 2, 2017). "Jerricho Cotchery named assistant wide receivers coach". Carolina Panthers. Retrieved August 8, 2017. ^ a b "Carolina Panthers' Jerricho Cotchery found strength in tragedy". charlotteobserver.com. Charlotte Observer. Retrieved July 23, 2015. ^ a b Houser, Ben (September 23, 2008). "Cotchery follows a path defined by faith". ESPN.com. Retrieved September 13, 2009.